The unwritten literature of the Indians of the Northwest Coast consists of innumerable myths, legends and tales handed down from generation to generation and from tribe to tribe for many years. Through both the passage of time and translation from language to language, original accounts have been altered in many ways. Some have become hopelessly involved, others garbled, some even embellished. Not a few have been "expurgated" since the arrival of missionaries as native tales are often obscene by our standards. While all myths, since they deal with the action of gods, supernatural beings and culture heroes, must be considered as religious in character, they must also be viewed as literature since they were told primarily to furnish amusement and entertainment. Raven’s role as a trickster could have had no other purpose. The various adventures of Raven, or "Yethl" as he is properly known, comprise the inspiration for many Tlingit and Haida totempole carvings. According to one version of the story, long before the creation of the world, there dwelt in the Land of Supernatural Beings, a powerful chief. He had a beautiful wife but was so jealous of her that he kept her in a box suspended from the ceiling of his house. Since his nephews would inherit her in the event of his death he was fearful lest they slay him to obtain his attractive wife. So to forestall such an event, he killed both his nephews before they became men. The mother of the slain boys, the sister of the chief, fled to a lonely spot to mourn her loss. It was there that Crane appeared before her, and learning of her grief, instructed her how to replace her loss. She was told to pick a smooth, round pebble from the beach, heat it in the fire and swallow it. She followed Crane’s directions and in due time a son was born to her whom she named Yethl. Fearing that he, too, would be killed, she concealed the fact of his birth from the Chief. But Yethl was no ordinary son. In ten days he had grown to the full stature of a man and she could no longer conceal him. Presenting him to her brother, she was warmly congratulated and the Chief pretended great friendship for his new nephew. Secretly, however, he planned to do away with him, also. One day the Chief took Yethl fishing with him, intending to drown him. But when the canoe was capsized, Yethl, who had on his magic diving suit, walked along the bottom until he reached the shore. At another time the murderous Chief tried to trap him in an unfinished canoe but Yethl not only escaped but brought home the canoe. After repeated attempts to murder his nephew the Chief gave up and went off hunting, leaving Yethl alone for the first time. As the uncle had suspected, Yethl went immediately to the box holding the beautiful woman and cut it down. But as he lifted her out, two small birds that had been concealed in her armpits flew up and out through the smoke hole. Knowing that they would warn his uncle, Yethl changed himself into a Raven and flew into the sky. Informed by the birds of his nephew’s act, the Chief, in great rage, ordered the seas to rise and flood the land, hoping to drown his rival. But Yethl hung onto the heavens with his bill and eventually flew down, landing in a bed of floating seaweed. Yethl now ordered Sea Otter to dive down and bring up some sand, and out of this he created the barren earth. Seaweed, which he chewed up and spat onto the sand, became vegetation of all kinds. He next created fish and animals and finally man. He tried to make man first out of stone but was not satisfied with his work. Stone was too strong and enduring and he knew that the gods would be apprehensive that men might be too powerful. So he made man out of wood, and, pleased with his success, made women of wood, also. Yethl now seems to have taken on the role of man’s chief benefactor. He brought fire to the world by carrying a burning brand in his beak from the island were all fire was at that time. When the fire burned his beak he dropped the brand and fire was deposited in the sticks and stones wherever the sparks fell. Man thereafter could get it out by striking the stones together or rubbing the wood vigorously. He stole fresh water from its owner, Ganook. But in trying to escape with it he was held in the smokehole long enough to have his feathers permanently blackened. Prior to that time Raven was white. As Yethl flew across the land, drops of water falling from his beak produced lakes and rivers and smaller drops made the creeks and springs. Yethl’s effort to get light for the earth was the adventure that provided material for several famous totempoles. According to one of several versions, Yethl’s world was one of darkness, for another magician known as Raven-at-the-head-of-the-Nass had the sun, moon and stars boxed up in his house. Yethl intended to steal the sun but the problem was how to get into the closely-guarded house. From "Frog," Yethl learned that the magician had a daughter. "Mink," the girl’s personal servant, told him of a spring where the maiden went daily for a drink of water. By transforming himself into a hemlock needle and dropping into her drinking water, Yethl was swallowed and in due time was reborn as the magician’s grandson. Thus, he gained access to the house. "Young Raven," as Yethl is known in this stage of his adventures, was reborn in human form, but his Raven ancestry was revealed in his sharp, blinking eyes. He succeeded in endearing himself to his unsuspecting grandfather who gratified his every whim. When he cried for one of the boxes hanging from the ceiling, he got it, and when left alone for a moment, removed the ropes that bound it and took off the cover. There were the stars! Yethl rolled them about like marbles and then playfully tossed them out through the smoke hole where they took their places in the sky. But the stars were not bright enough to light the night so Yethl cried again and again for another box. At length his grandfather gave in and took down the box containing the moon. As before, Yethl watched his chance and when alone, removed the moon and tossed it out through the smoke hole. It soared up into the heavens and took its place among the stars. Yethl now knew that the remaining box contained the sun so again he wailed until the grandfather, fearful that the child would die, took down his proudest possession and gave it to the infant. This time, as soon as he was alone, Yethl changed himself back into a Raven and, taking the box, flew out through the smoke hole. He apparently resumed human form as soon as he was safe from pursuit and walked northward looking for people. He found men at length on the far side of a river and asked them to take him across, telling them that he had daylight. But they would not believe him nor would they help him across. At last, out of patience, Yethl opened the box and blinding light sprang forth. The people were terrified. Those wearing the skins of animals rushed into the woods and became "Forest People." Those having garments made of sea animal hides plunged into the water and became "Sea People." Those wearing bird skin clothing flew into the air and became "People of the Sky." That is why Indians still regard all of these beings as humans in disguise, but who, on occasion may resume human form. Other Raven stories, possibly of more recent date, indicate that much of Yethl’s character was suggested by the bird itself. Ravens are common throughout the Totempolar region and are noted for their voracious appetites, their cunning and sagacity. The Haidas and Tsimshians also have stories wherein Raven is featured as creator or special benefactor of man. They show evidence of having been borrowed from the Tlingit and often the details of several of Yethl’s adventures are boiled into one story. As one proceeds southward, the Raven stories fade out until, leaving the totempole area we find his place taken by other tricksters such as Coyote. In one of the Kwakiutl tales, Thunderbird plays a role similar to that of Raven as man’s benefactor. As one version of the story goes, Thunderbird, looking down from his home in the skies, observed how wretched an existence man was leading and, feeling sorry for him, decided to teach him how to live. Choosing a favorable location in a berry patch beside a large river, Thunderbird descended, assumed the form of man and set about building himself a fine community house. Then he made a large dugout canoe and hunting, fishing and household equipment. Everything he made, he decorated with carvings, and many of his things he painted, also. Then he caught and dried fish, trapped animals for meat and furs and put up many boxes of oil, berries, crabapples and other foods for the winter. To help him in his work, Thunderbird captured a slave and for guardian of his property he chose the grizzly bear. When everything was complete in his establishment, Thunderbird rested and waited for men to appear. One day some Indians came by and stood at a distance marveling at the beautiful house. Thunderbird went down to them and invited the group to be his guests. He showed them everything he had made, explained its use and told them how to do everything that he had done. Then he fed them in beautiful dishes and as each new food was brought in he told them how it had been prepared. But when the visitors made ready to leave, they began taking everything that Thunderbird had shown them. He protested that this was his property and that they would have to make their own. But instead of being grateful for the instruction, they robbed their benefactor and when he protested further, they bound him and took him away as their prisoner. They had not gone far when clouds began to form overhead. Then the wind came up and great waves lashed at their canoe, threatening to capsize it. Lightning flashed and the thunder rolled. The Indians were terror-stricken, for they feared they would all be drowned. Then one of the men discovered that the lightning was coming from their captive’s eyes. It now became apparent to them that their host had been Thunderbird in disguise. Admitting the error of their ways, the Indians begged Thunderbird to quiet the storm, promising to release him and return his property and to live thereafter by his teachings. Thunderbird forgave his captors, quieted the storm and the men took him and his property home. As time went on, Thunderbird married the daughter of a nearby chief and they became the progenitors of an important Kwakiutl line. This family still records the origin of their clan on their totempoles. (See picture on page 53.) At the top is Thunderbird with outspread wings. His feet rest upon the head of his grizzly bear watchman. Encircled by the bear's paws is the head of a slave and beneath the slave is a chief’s "copper," the Kwakiutl sign of chiefly status. Some myths are told for the purpose of explaining and accounting for certain taboos. The story of Shin-quo-klah or "Moldy End" is told in numerous versions by all three Northern tribes to account for the salmon taboos. Shin-quo-klah, a high caste Tlingit boy, according to the Haidas, lived at Karta Bay on the east coast of Prince of Wales Island. One day, being hungry, he asked his mother for a piece of dried salmon. She gave him some that had been kept two years but, finding it moldy at one end, the boy threw it into the water. Some time later some children shouted to him that a seagull was in his snare. When Shin-quo-klah went down to the beach to remove the seagull, it struggled out into deep water and the boy followed. Suddenly he disappeared under the waves. The people thought he had stepped into a hole and was drowned but though they searched for his body many days it was never found. But Shin-quo-klah was not drowned. He had only been pulled beneath the sea by the Salmon People who wished to reward him. In throwing the moldy salmon into the water it had given back the life of one of their people, for it was only when a salmon was eaten and the remains burned or thrown into the water that a salmon could resume his life in human form beneath the sea. Shin-quo-klah was placed in a large canoe and after several days traveling, found himself in a village made up of community houses similar to those in which his people resided. But the doors were alive and the houseposts could talk. He was shown the shark house whose entrance was like a shark’s mouth, studded with sharp teeth. Bad people lived there, he was told, and he was warned to stay away from them. In the Salmon People’s village, the boy became very hungry but he didn’t know how to get food. He was told to go to the Herring People’s house. There, they would be dancing but what looked like feathers flying in the air was not feathers, they said. He was instructed to take a hemlock bough and hold it inside the doorway, keeping his eyes closed. When it got heavy he was to withdraw it and he’d find something good to eat. Following these instructions, the boy found that the "feathers" were really herring eggs, of which he ate his fill. That is why Indians still spread hemlock boughs to catch the herring eggs when they spawn. On another occasion when he was hungry for fish, a woman who was solid stone from the waist down called him to her. "If you are hungry," she said, "go down to Amusement creek where the children are playing. Club one of them and you will find something to eat." Amusement creek got its name from the fact that the ducks, geese, gulls, crane and brant played there and made a great noise calling to each other. One other time when he was lonesome and downhearted they had taken him there to cheer him up and had put his arms around a prancing sandhill crane’s neck. Shin-quo-klah was reluctant to hurt any of the children but finally, hunger impelling, he struck one of them. Instantly it changed into a bright young spring salmon. The boy built a fire and roasted the fish at one. After his meal he threw the remains into the water and returned to the village feeling much better. The town was in an uproar when Shin-quo-klah returned. One of the chief’s children had a terrible toothache and they could do nothing for it. The Stone woman called the boy to her and told him it must be his fault. She urged him to go back to see if he had thrown all of the bones into the water. When Shin-quo-klah reached the place where he had cooked the fish he made a careful search. At the bottom of the hole in which he had stuck his roasting stick was part of the salmon’s jawbone. This he threw into the water. When he returned to the village the child’s toothache was gone and everybody was happy again. Once when Shin-quo-klah went swimming with some of the Salmon People boys he leaped above the surface of the water. Nearby was a canoe in which two Indian men were sitting. "Look!" shouted one, "There is a bright young spring salmon!" That was the first time that the boy realized that even he appeared as a salmon to men. Two or three years went by and then one day the chief told his people to get ready for a long trip. All were loaded into canoes and made into companies, each of which was under the direction of a leader. Then they started off towards land and the villages of men. As they moved along all were in high spirits. They met great companies of Herring People returning from their trip to the land of men. "Why are you black under your backbones?" twitted the Herring-folk. "Where is your cheek fat?" returned the Salmon. "Our eggs are our cheek fat!" proudly answered the Herring People. As each river’s mouth was reached, the Salmon Chief assigned a company to enter it. But occasionally a river was passed by, for here the people had disobeyed the salmon taboos and had to be punished. Shin-quo-klah was in the company dispatched to the river beside which stood his native village. As he swam in closer he found the river bank lined with squatting women, all cleaning fish. Among them was the boy’s mother and seeing her, he swam in close to admonish her to pull down her skirt, for the salmon who appeared to be finning were actually laughing at the women and the boy was embarrassed. But she espied the salmon and calling to her husband said, "Here is a bright young spring salmon. Spear it for our supper." The salmon was speared but when the father attempted to cut off its head, the knife would not go through. Examining the blade, the astonished man saw on its edge, little fragments of copper. Suddenly, he remembered that his lost son was wearing a copper collar when he disappeared. Realizing he was dealing with the supernatural, he ordered all the women out of his household. Then all the men drank salt water to purify themselves for the undertaking that was to follow. The salmon was placed in a basket and set under the roof where the eaves would drip on it. Slowly the skin began to slip away, revealing the form of their lost son. When free from the salmon skin, the boy grew rapidly and in a few days was restored to his former size. Because of his experience with the Salmon People, Shin-quo-klah became a great Shaman. He taught the people the Salmon taboos and saw to it that they were never broken. Years went by and the Shaman became very old, in fact, he lived far longer than any one else in the community. His hair which had never been cut nearly reached the ground. He was greatly respected for his wisdom as well as for his great age. One spring the river was full of fish and all the villagers were busy putting up their winter’s supply. Then one saw a salmon different from all the rest. It was transparent like glass and some accounts say it had a red feather on its head. All the men and boys were trying to spear it but none of them could touch it. Noticing the excitement, Shin-quo-klah hobbled down to the river bank and someone, handing him a spear, said, "Here, see if you can hit it." The old Shaman took the spear and hurled it. It went straight to the mark, struck the salmon in the neck, killing it. But at the same instant, Shin-quo-klah fell to the ground, dying. He had killed his own soul. Shin-quo-klah’s last request was that he be dressed in his Shaman’s robes and that he and all his paraphernalia be placed on a raft and floated down the river. This request was carried out and the raft bearing the dead Shaman and his drums was set adrift. Down the river it went until it came opposite a steep cliff. There the raft spun around four times and sank in the whirlpool. Men say that even today when important things are about to happen to those people, Shin-quo-klah’s drum can be heard from the depths, beating a muffled warning. And some say he still comes up the river with the salmon. One old man who has seen him says he is only about four feet long but his hair trails many feet behind him. The legends of these totem carvers are principally made up of tales of migrations, the flood, inter-tribal wars and early contacts with white men. All groups have accounts of a flood that inundated all of the land save the highest peaks. Curiously, these accounts are so localized that the major peak in any locality is generally referred to as the one on which the people were saved. 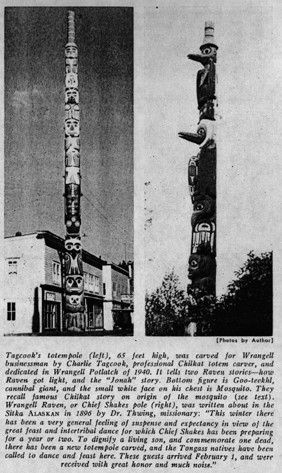 The story is the inspiration for several totempoles, notably the Bear Totem of the Nanyaayis at Wrangell and the Devil’s Thumb totem at the same place. The Haidas have legends of migrations from the East Coast of the Queen Charlotte Islands to the West Coast and from North Island (Langara) across Dixon’s Entrance to Dall Island in Alaska. Both of these legends are historically correct, the migrations having occurred within the past two hundred years or so. They have no legends telling of any earlier homeland although they generally believe they came from a distant land. As proof they cite the fact that they were forced to adopt Tlingit names for things in their new environment that were not known in the old. Tlingit migration stories tell of crossing great continental plains and mountain ranges but do not mention crossing seas. At one place in their great trek, three-bladed grass cut their legs like knives and the wounded had to be sent back to the rear. Following a great river to the coast, they found their descent to the sea cut off by a glacier. Strong young men went over the glacier to view the country beyond and old men, soon to die anyway, went under the glacier to see if it were possible to get through alive. When they emerged safely the news was carried back and the main body passed under the obstructing glacier. The feat gave rise to a Tlingit axiom to the effect that "when difficulties are too great to be surmounted, go under them." Arriving at the coast, the Tlingits expanded Northward and were already in the Prince William Sound district attacking the Eskimos when the Russians arrived. It is generally agreed that they formerly lived in the region now occupied by the Tsimshians but it is not established that they were pushed out by them. Some Tlingit families even claim origin in the Queen Charlotte Islands but it is not known that the Haidas displaced them. The story of the migrations of the Nan-yaa-yi of Wrangell is typical of many of the Tlingit legends. A large band of Indians of the Wolf totem descended the Taku river and established themselves nearby at Taku Inlet. From this band as time went on, groups migrated to other more favorable locations. One such band built a community house at Hoonah but were burned out. From the charred timbers they reconstructed their house, thereby acquiring the name "Kok-wan-ton" or "people-who-live-under-burned-timbers." Two other groups turned southward and ascended the Stikine river. One settled at the "signa" or "grindstone" place and came to be known as the "Signahudi." The other group went to a place "beyond" and thereby acquired the name "Nan-yaa-yi" or "the-people-camped-beyond." Here they became wealthy in trade as their location made them middlemen between the interior Tahltans and Kaska and the coast people. These interior Indians came to regard the Nan-yaa-yi chiefs as their overlords. As time went on some of the Nan-yaa-yi returned to the mouth of the Stikine river and resided on an island there for several generations. But the bitter Stikine wind finally drove them out and they built a new town a few miles to the south, called Chugas-an or "waterfall town." Here inter-tribal trouble caused another split-up, and one chief and his followers moved away. On Wrangell island, at a point some twenty-five miles distant, a stand of willows was regarded as a good omen since it reminded the migrants of the river country in which they had once lived. Here they built a new town known as Kotslit-an, or "Willow town." Today its ruins are better known as "Old Wrangell." There came then a time of warfare with the Tsimshians of the Nass river country but the Nan-yaa-yi were finally victorious and their chief acquired the Tsimshian chief’s name, "We-Shakes" subsequently shortened to "Shakes." This began a succession of Chiefs "Shakes," the seventh and last of the line dying in 1944. It was the fourth of this line, "Shawt-shugo-ish" who abandoned Kotslit-an and led his people to Wrangell, eighteen miles to the North where they built their new village under the guns of the Russian fort which was completed in 1834. The best-known Chief Shakes was "Kow-ish-te" (Shakes V), the nephew of Shawt-shugo-ish. During his chieftainship, Redoubt St. Dionysius of the Russians was leased to the British and in 1840 was re-named Fort Stikine. He was still chief in 1867 when the Americans took over and the village came to be known to the American military as Fort Wrangell, subsequently altered to Wrangell. From then on the Indian legends merge with American history, and Indian affairs are well-documented thereafter. Many Indian legends tell of the Natives’ first encounters with white men and the Haidas actually celebrated their "discovery" of Victoria, B.C. and made a blanket to commemorate the event. Although there seem to be no accounts of Chirikof’s and Bering’s landings in 1741, other accounts tell of La Perouse at Lituya Bay and of Capt. George Vancouver at several points. Mackenzie in 1793 found Coast Indians who referred to Vancouver as "Macubah" and Menzies as "Benzins." A Tsimshian story of their first encounter with white men concerns Sabahan who was offshore fishing for halibut when his party saw a strange monster approaching them out of the fog. It was black and shiny, and its numerous long legs lifted, then touched the water with rhythmic beat, causing it to move over the water at an astonishing speed. Sabahan and his companions pulled up their lines and started paddling furiously for shore. But the monster raced after them, gaining at every stroke. Sabahan, believing that they would be killed, tied his kelp fish-line around his body and fastened it to the canoe, hoping thereby that his body would at least be found. But the canoe reached shore first and the Indians sprang out, disappearing in the forest. That is, all but poor Sabahan. He had forgotten that he had tied himself to the canoe. He ran until, coming to the end of the line, he was suddenly snapped back into the arms of his pursuers. It was not a water monster, however. It was only a band of friendly men with pale faces, dressed in dripping black oilskins. Using sign language, the white men indicated they wished Sabahan to build a fire. He understood, and taking some wax from his ear, started to make fire by friction. The white men, apparently believing this process too tedious, gathered dry grass. Then one of them, taking his pistol, fired into the mass. Immediately it burst into flame, and Sabahan fell to the ground in a faint. When he revived, he felt himself all over carefully to see if he was uninjured. Believing now that he was in the presence of supernatural beings, Sabahan urinated into his hands, then washed his face in it as a precaution. Presently the white men, indicating the halibut in Sabahan’s canoe, made known to him that they wanted him to prepare some for cooking. Sabahan began dressing the fish with a mussel shell but was soon stopped. Then one of the men pulled something bright and shining from his side, struck the fish a few rapid blows, and it fell in pieces before the amazed eyes of Sabahan. The other Indians who had been lurking in the trees, watching, were now beckoned by Sabahan to come out of hiding since he was sure the strangers meant no harm. Later the white men were guided to the Indian village where they were fed Indian food and given presents. Then the Indians were invited out to Vancouver’s ship to taste white men’s food and to receive presents. As they approached the ship riding at anchor, its sails furled, the Indians became very apprehensive. The rigging looked like the web of a gigantic spider and the blocks appeared as the heads of its victims. Sabahan reassured them and the party went aboard. First they were offered hardtack but it looked to them like the bracket fungi that grow on dead trees. Sabahan tasted it and told them it was good. Then they were offered boiled rice but it looked like maggots. Again Sabahan tasted it first and pronounced it good, whereupon the others fell to. Then they were given molasses to eat on their rice. This they thought was spoiled blood but Sabahan tasted it warily and pronounced it sweet. Then they all ate heartily and enjoyed the new food. Presents were then distributed to all. Some were given knives, others beads, buttons, bells and articles of clothing. Sabahan received the most wonderful gift of all. It was a small mirror in which he saw his own face for the first time. With this mirror, Sabahan became a very wealthy man, for people came to believe that in it they could see their futures. Sabahan, capitalizing on their credulity, charged them so much a look. Numerous tales, sometimes tragic, often humorous, recount the receiving of firearms for the first time. A group of Haidas, having purchased their first musket, got into an argument regarding the proper method of aiming. One said it should be held to the shoulder. Another insisted that it must be held against the nose so you could look down the barrel with both eyes. He won, getting a broken nose for his pains. One chief had great fun shooting his friends off a cliff. The spectators thought it was great fun until they discovered their friends were being killed. A war flotilla of Haidas met a similar party of Tsimshians. The Haidas suddenly fired a musket into the air. The amazed Tsimshians leaped into the water and the battle was over. The traders who first sold muskets often sold unsuspecting natives guns but no powder, or powder but no shot. One Indian brought his gun back, exclaiming, "Whatsa-matter him allatime go Click, no go Pow!" it was not long, however, until the natives were melting up pewter pots for shot and even firing charges of sold and copper nuggets in lieu of lead. There are Indian accounts of the battle of Sitka between the Tlingits and Russians but according to their record, the Indians won. The bombardment and burning of Kake by the gunboat Saginaw in 1869 as told by the natives is surprisingly similar to published account. But the story of the Kake Indians killing Colonel Ebey on Whidby Island in 1857 and carrying his head home for a trophy seems to have been forgotten entirely. Indians of the totempolar region still like to tell stories and reminisce on the old times but with the passing of the community houses story-telling gatherings are few and far between. The general adoption of the English language and the coming of schools and churches have contributed to the extinction of native literature. Few of the young people today know any of their own stories and almost none can tell the significance of totempoles. But sometimes, out on hunting, fishing or trapping trips, sitting around camp fires, the old spirit returns and Raven is again Yethl. Then the woods are filled with supernatural beings, animals are again people and witches are rampant.